Tippi Hedren in Alfred Hitchcock’s “The Birds.” Courtesy of Universal Pictures. There’s a reason why great works of art are built to last. They tap into universal themes that can be applied to any generation, any culture, any personal life experience. “The Shining” takes issues such as alcoholism and the inability to learn from one’s past and amplifies them with mesmerizing artistry, inspiring audiences to project their own ideas onto the canvas, resulting in a wide variety of interpretations. This is not an “incorrect” way to view a picture, but rather, an example of how we engage with artworks, gleaning from them insights that we can apply to our own lives. “The Shining” is not “officially” about Native American genocide, but it is a cautionary tale about the denial of one’s blood-drenched history. Some of the most powerful lessons are the ones conveyed indirectly. Much has been written about the complexities of Alfred Hitchcock’s 1963 masterpiece, “The Birds,” an audacious apocalyptic thriller that invites impassioned post-screening debates through its deliberate ambiguity. It wasn’t until I recently viewed it again for the umpteenth time that an epiphany materialized out of the clear blue sky like a rogue gull and nicked me in the head: this uncommonly unsettling classic is a film for our time. It connects strikingly with modern environmental crises that stress the importance of not taking nature for granted. What can appear harmless one moment can become a threat the next if the proper attention is not devoted to its needs. Unrelenting selfishness and a refusal to evolve will ultimately spell doom for mankind. Whereas current films such as Bong Joon-ho’s rollicking Gilliam-esque entertainment “Snowpiercer” explores the aftermath of humanity’s self-destruction, “The Birds” suggests its root causes with poetic observation. 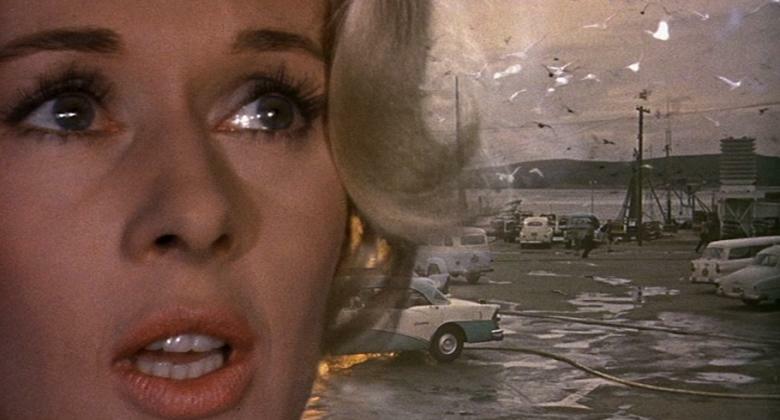 Of course, no single person is responsible for the birds’ sudden transformation into carnivorous avengers, though the townsfolk of quaint, isolated Bodega Bay find an obvious scapegoat in their midst: visiting socialite Melanie (Tippi Hedren). Surely it is her scandalous past that has caused god’s wrath to befall the community. It’s difficult to watch the crazed mother (Doreen Lang) wail about Melanie’s alleged “evil” without recalling the zealots who vocally blamed homosexuality for various natural disasters, not to mention 9/11. 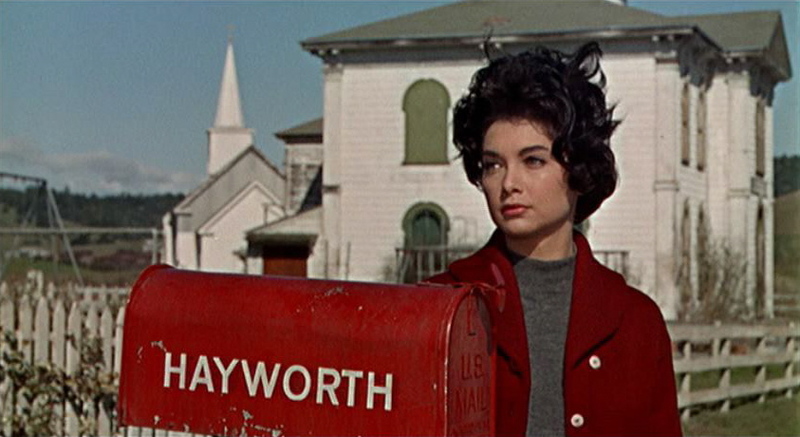 Suzanne Pleshette in Alfred Hitchcock’s “The Birds.” Courtesy of Universal Pictures. If the pursuit of personal gain is all that motivates us on our journey through life, we are leaving behind a path of waste and heartache that can prove ruinous for everyone. Consider Hitchcock’s marvelously droll trailer for “The Birds,” where the director lectures us about the careless ways in which humans have treated birds throughout history: caging them, hunting them, eating them, stuffing them and even rendering some of them extinct. It makes an avian attack seem almost inevitable, albeit in the most fantastical sense. Yet there’s a deeper truth here about the greed inherent in human nature—the same greed that is preventing us from altering our unsustainable lifestyles for the sake of our environment, our planet and all the future generations required to inhabit it. Whenever scientists issue dire warnings about Earth’s increasingly unstable state and what must be done to stop it from worsening, our natural tendency is to blot it out. Our lives are too stressful as it is, and it’s much easier to live in the past than face reality. The two most touching performances in “The Birds” are delivered by Jessica Tandy as Mitch’s mother, Lydia, and Suzanne Pleshette as the schoolteacher, Annie. Both women are clinging helplessly to a past that no longer exists. Lydia is still grieving the death of her husband and is using her son as an unhealthy replacement, while treating any woman who enters his life as an enemy. Annie has chosen to stay in Bodega Bay simply so she can remain near her former flame, Mitch, while brooding about in self-pitying despair. 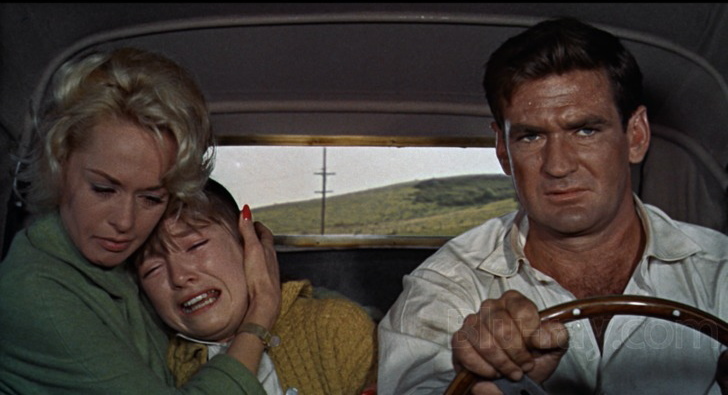 Tippi Hedren, Veronica Cartwright and Rod Taylor in Alfred Hitchcock’s “The Birds.” Courtesy of Blu-ray.com. Neither Lydia nor Annie has chosen a life that is realistic let alone sustainable. Eventually they must change or face the consequences, and the onslaught of the birds serve as a symbol for the world they have neglected and has refused to be silenced. When Annie sacrifices herself to save the life of Mitch’s little sister (Veronica Cartwright), it’s enormously moving yet also a sad reflection of the woman’s chosen fate, which was already tantamount to suicide. She may view Melanie as a rival but never treats her like one, welcoming her instead with melancholy tenderness. Perhaps she views the naive blonde as the latest victim of Lydia’s inevitable scorn, and is already planning out the assistant teacher position Melanie will fill in a fit of heartbroken bitterness. Lydia is the latest in a long line of fearsome mother figures in Hitchcock pictures, yet she’s also the first since Patricia Collinge in “Shadow of a Doubt” that the director treats with genuine affection. After observing the birds’ shocking carnage, Lydia finally opens up to Melanie, confessing her grief-stricken paranoia with naked honesty. This is the first crucial step towards breaking free from self-made prisons that entrap our potential to grow in our understanding of the world around us and ourselves. Melanie has a similar scene where she candidly explains to Mitch that her family life was not a happy one, irrevocably marred by an absent mother. Maybe the lack of love she received from her parents has given her a distrust of or cynicism toward relationships. Regardless of one’s interpretation, there is no denying the cathartic grace that blossoms between Melanie and Lydia in the film’s very final moments. Horribly injured and in need of medical attention, Melanie lies in a catatonic daze on Lydia’s lap in the back of Mitch’s car as he drives stealthily past the plethora of birds crowding their driveway. In an unforgettable close-up, Melanie squeezes Lydia’s arm and gazes up at her, suddenly finding in her the mother she never had. Discovering her revitalized purpose in life, Lydia smiles and embraces Melanie, cradling her as if she were her own daughter. No wonder the birds let them go peacefully. Only by banding together as a united family of man do we, as a species, have a prayer for survival. Excellent review. This film is so much more than folks give it credit for. It’s much too easy to pass it off as just “Hitchcock’s B-movie”. It really reminds me of what David Lynch just did with the new season of Twin Peaks in exploring the consequences of human selfishness.